It is my great pleasure to send this message to you all. Dagon University, one of the largest universities in Myanmar has been established since 1993. We all, not only administrative staff but also teaching staff, have been striving our best for creating a place which can create good academic atmosphere that is relied and valued by society and that can shape to build modern and developed democratic nation. Moreover, we are making earnest endeavours to be able to nurture outstanding students, which is our university’s motto. In so doing, our main purpose is to produce not only good academicians but also outstanding graduates who can be pillars of the development of the nation in future. Regarding the constitution of our university, there are twenty departments in our university: 12 Arts departments and 8 Science departments. Anthropology, Archaeology, Economics, English, Geography, History, International Relations, Law, Myanmar, Oriental Studies, Philosophy, and Psychology are Arts departments and Botany, Chemistry, Computer Studies, Geology, Industrial Chemistry, Mathematics and Physics and Zoology Science departments. All the departments are endeavouring to provide students basic academic foundation as well as professional knowledge which they can apply not only in doing research but also in their real lives. Conducting research plays a vital role in promoting education standard as well as in fulfilling the needs of local community. Therefore, Dagon University provides students fully equipped laboratories, multi-media classrooms, language labs and four-storeyed library, in which students can access to a wide range of scholarly e-journal and e-book collections, reference books as well as the Internet 24/7. In addition, Dagon University has signed more than 30 MoU/ MoA with international universities and institutions so that we can create stronger university network with them and gain not only new insights about different subject matters but also knowledge and experience about diverse culture via student and faculty exchange programs between the signed institutions. What’s more, today’s youths are required to possess 21st century skills: critical thinking skill, problem solving skill, communication skill, creative thinking skill and collaboration skill, in addition to academic skill. Therefore, Dagon University encourages students to participate not only in academic activities but also in other social activities such as service-learning activities, scout, red-cross etc., so as to develop them as a whole person. Last but not least, as an Alma-Mater, I would like to invite all alumni to give suggestions and actively participate in the activities done by Dagon University. I strongly believe that those activities can be fruitful for students to grow not only in physical but also in mental maturity. Hopefully, we can create better opportunities and situations for students to enhance their academic skill as well as other essential skills by joining all our hands together in all matters. It is believed that Dagon University is a good teaching learning environment that nurtures students to be well-qualified and creative students in the community and also provides a good physical environment for administrative staff and a good educational environment for researchers. Dagon University creates a good academic atmosphere where morally upright and professionally qualified human resources could be developed. Dagon University (DU), a national university under the jurisdiction of Ministry of Education, was established in 1993 and it has now a capacity for sixty thousands students. It is an Arts and Sciences University and situated 20 km north from Yangon City Center. The University offers Bachelor’s and Master’s degree programs in common liberal arts and sciences disciplines. 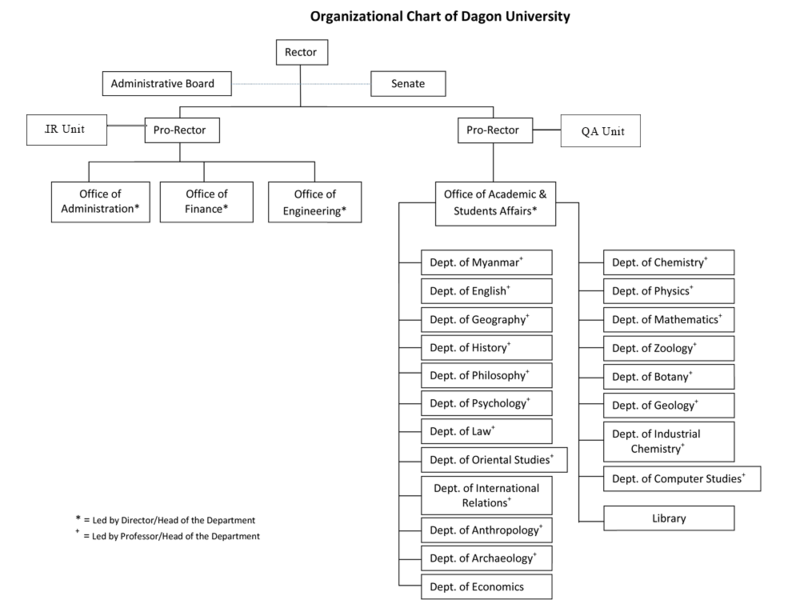 Twenty departments offer twenty eight teaching programs. There exist a various thematic fields such as Myanmar studies, English, geography, history, philosophy, psychology, law, oriental studies, international relations, anthropology, archaeology, chemistry, biochemistry, physics, meteorology, nuclear physics, mathematics, hydrology, zoology, biotechnology, botany, microbiology, geology, industrial chemistry and computer studies. Currently, twenty-three thousand students are attending regular classes. In addition, another thirty-seven thousand students take lectures conducted at Dagon University Branch, University of Distance Education. Moreover, DU offers some diploma courses under Human Resource Development Program (HRD), for instance, diploma in computer studies and diploma in spatial information. One thousand and forty three academic staff including thirty three professors are working at Dagon University. In addition, 529 administrative staff manage all affairs of the university such as administrative, financial, academic, international and social affairs etc. Concerning extra-curriculum activities at DU, there are key activities for sports, performing art competitions, moral and capacity building programs, experiential learning programs such as service-learning, seminars, talks, workshops on various topics like Climate Change, Anti-narcotic Drugs and Traffic Rules and Regulations, National Patriotism. Dagon University encourages it students to engage in community works voluntarily. 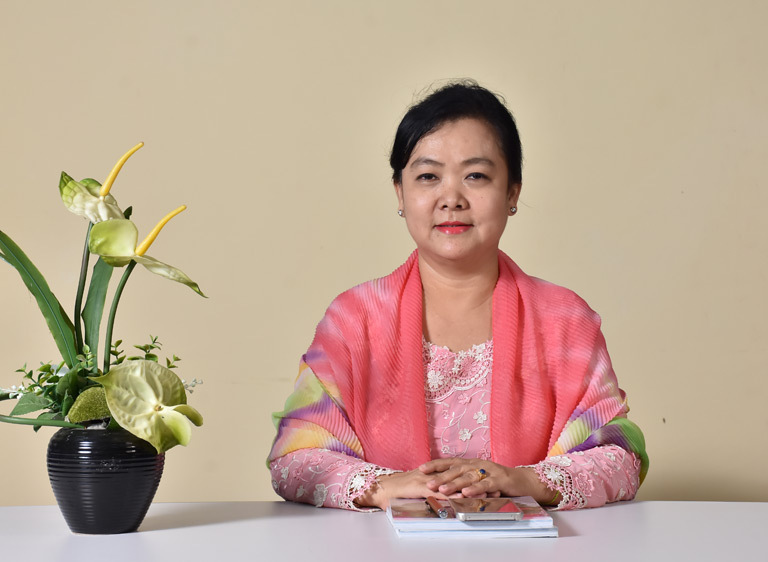 In addition, a Student Service Centre has been launched in Dagon University since June, 2013 and senior faculty members are interchangeably assigned to foster communication with students in order to meet students’ needs and solve their problems. Recently, education reforms have been launched in Myanmar. These pave the way for DU to collaborate with international institutions. DU has already signed MoU with more than twenty global universities. 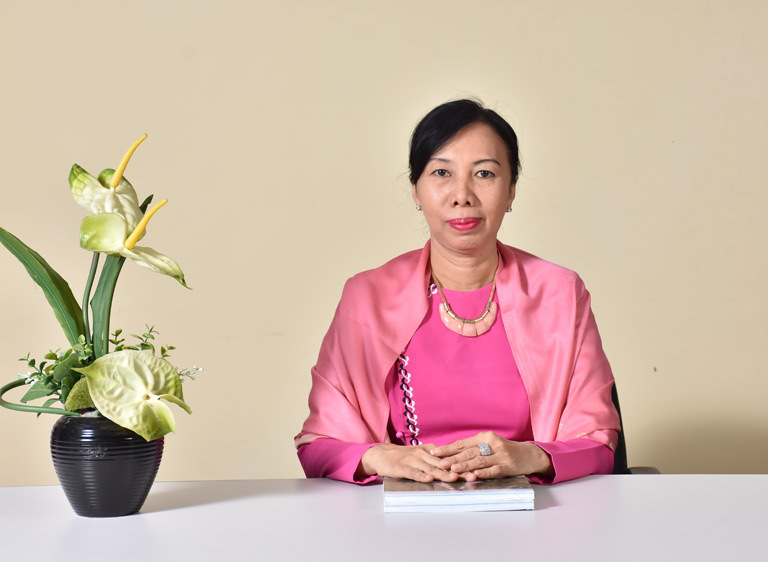 Dagon University commenced on 15.11.93 and the first Rector was U Kaung Nyunt. At that time the university was able to offer only eight majors: Myanmar, geography, history, physics, chemistry, mathematics, zoology and botany and number of total students were only 1298. Next academic year, university was able to offer sixteen majors that included English, Oriental Studies, Philosophy, Law, International Relations, Psychology, Industrial Chemistry and Geology. In the Fiscal Year 1998-1999, Master course started. On 16.12.99 University of Yangon (Hlaing Campus) merged with Dagon University. In 2000, Master of Research course was introduced at Dagon University.